You can hear the surf from this classic holiday house as it is only a short stroll from the Cape Paterson surf beach. With two levels this home has two self contained areas with external stairs on both sides. It can function as a one bedroom apartment upstairs or expand to include 2 additional bedrooms and another living space downstairs. Ideal for either a couple or one or two families. Upstairs has the main bedroom with a Queen bed, main living and dining areas, fully equipped kitchen, bathroom, covered outdoor entertainment area with shade blinds and a deck with barbeque. Downstairs has two bedrooms, one with a Queen bed and single bed, the other with three singles and a trundle. A porta-cot is also available. There is a second living area, kitchenette, bathroom and laundry. Both living areas have TVs and there is a music system upstairs, a DVD player and movies downstairs and games for all ages. There is split system AC/heating and ceiling fans in the bedrooms. The yard is grassy and treed, and has various sports equipment includinga table tennis table and kids climbing toy. . There is a carport, patio area and undercover wetsuit drying rail and clothes line. Doonas and pillows are provided. Please bring linen ie sheets, pillow cases, towels, bathmats and tea-towels. The main Cape Paterson surf beach is only 500m walk, the general store and hotel are also 500m away and a delightful sheltered beach and sand blasted rock pool is an 800m walk. Both these beaches are patrolled in summer. More adventurous surfers can take on a variety of surf beaches close to town. Cape Paterson has lots of walking tracks, surfing, snorkelling, fishing, free tennis courts and of course beaches and rock platforms to explore. Wonthaggi is a 10 minute drive and has supermarkets, cinema, pool, and cafes. Inverloch is a picturesque 10 minute drive along the coast and has cafes, restaurants and galleries. Phillip Island and all its attractions are a 25 min drive and Wilsons Promontory is close by as well. There are golf courses, wineries and natural attractions nearby. A bond (refundable damage deposit or RDD) of $400 is required and will be refunded within 7 days after checkout. Full terms and conditions are available on request. Payment of a deposit constitutes acceptance of the terms and conditions. Bookings for January must be for a minimum of 7 days. Check-in and check-out is on Fridays for this period only. Comfortable, Great Location, Close to Shops and Beach. We have stayed at the property twice now. It is very comfortable, great for more than one as the property has upstairs facilities and downstairs facilities, The deck would be great in summer. It is a close walk to shops, pub and the beach. 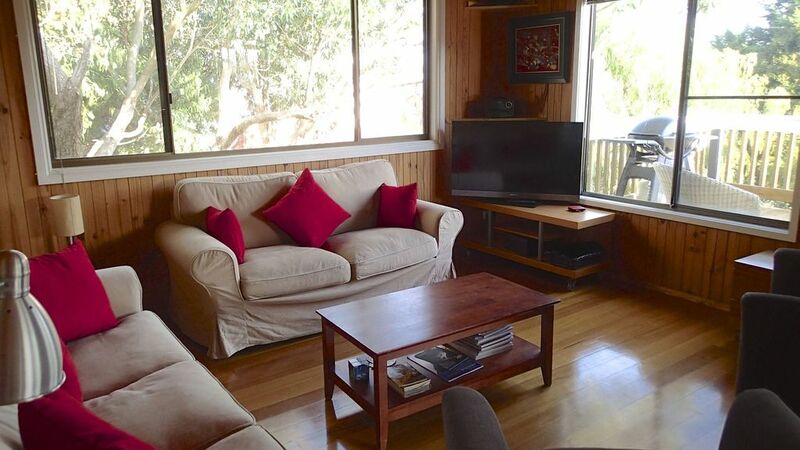 We also have a Holiday House that we rent out in Cape Paterson. It was great to learn off this property how they have set up their home. Excellent home and great proximity to the beach. We had a fabulous time. Loved the seperate downstairs and upstairs units which provided independent living when required or desired. Everything was well provided and organised for our stay and being so close to the surf beach was fantastic. Place was clean and tidy, exactly as the pictures. Loved staying here. Great location, clean , tidy and comfortable. It had everything we needed for a great mini break. Our only disappointment ( which was only minor and short lived) was the coffee machine in the photos was not there when we arrived and we are big coffee drinkers. The Cafe round the corner was fantastic for coffee and we enjoyed a lovely stroll each time we wanted one.